Savvy Spending: Amazon: TurboTax Deluxe + State Tax software for just $49.99 plus a $10 Amazon gift card! 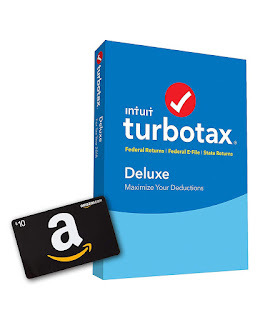 Amazon: TurboTax Deluxe + State Tax software for just $49.99 plus a $10 Amazon gift card! Amazon has the TurboTax Deluxe + State 2018 Tax Software plus a $10 Amazon Gift Card (Physical) on sale for $49.99!